William Prescott was the son of a prominent family, his grandfather having commanded American forces at Bunker Hill. When he was blinded in one eye by a crust of bread flung in the Harvard Commons, he devoted his life to literature. Thanks to ample family means, an assistant was available to read to him. He could remember up to sixty pages while preparing to write chapters of The History of the Conquest of Mexico and The Conquest of Cuba, both widely read dramatic narratives. 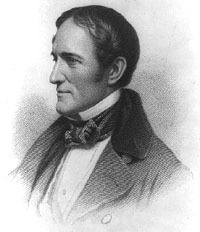 His biography was written by a close Unitarian friend and fellow American historian, George Ticknor.